Click here to find a car starter for your vehicle. The starter is one of the more critical components on your vehicle. In fact, without it, your vehicle won’t be going anywhere fast. In addition, the starter is the most common cause of no-start issues for automobiles second only to a dead battery. As such, it is critical that you make sure that your vehicle has a properly functioning starter. As the name implies, the function of the starter motor is to start your car’s internal combustion engine. A starter is comprised of a main body with an internal electric motor, a pinion gear, and the shaft that the pinion gear rides on. As you turn the vehicle ignition switch to ‘start’ with your key, a small amount of voltage is sent to the starter solenoid which in turn allows the battery to apply current to the starter. The solenoid is also responsible for engaging the pinion gear, allowing it to mesh with and spin the ring gear (aka the flywheel or flex plate depending on transmission type) to rotate the engine for the combustion cycle to start. Before you throw in the towel on your current starter, there are a handful of other items you should check to make sure they aren’t the source of the problem. You may hear a single loud click that could be a bad solenoid that fails to transfer battery power to the starter. A low whining noise or a slow turning of the starter pinion gear could indicate a problem with battery charge or battery cables that aren’t making good contact with the battery. The last thing to confirm is that the ignition is sending a small voltage to the solenoid to signal it to allow power to go to the battery. If all of those are OK, then it’s definitely time to start looking at the starter motor as the potential problem. Freewheeling – This occurs when the starter pinion gear spins, but doesn’t engage with the starter ring gear to turn the engine. What you hear is the whirring of the gear on the shaft, but since the gears aren’t engaged, nothing else happens. Usually the solenoid is the culprit here, but as it is most often integrated with the starter, both usually require replacement. Smoke – Your starter could emit smoke from the housing or the wiring. This is usually an indication that the starter is drawing too much power from the battery, has been run too long without being able to cool properly, or has faulty/failed wiring. A burning smell usually accompanies the smoke. Grinding Gears – When you hear a grinding noise, typically the starter pinion gear has worn teeth that are not engaging with the ring gear correctly. This normally is a progressive problem that only occurs occasionally at first. Over time this problem compounds and becomes more frequent due to uneven loading of the gear teeth. It’s best to catch it early when you hear the sound initially and not let it progress too far otherwise you may find yourself stranded in a parking lot somewhere. Oil Soaking – The starter is typically located on the bottom of the engine, and as the engine ages it can start to leak fluids. Oil has a way of finding entry into your starter and wreaking havoc on the pinion gear and circuitry. It can build up and cause the pinion gear to respond slowly or not at all, and can also cause the circuitry to stop working. We’d suggest fixing the oil leak when you replace the starter to prevent a recurrence. Malfunctioning Solenoid – On most starters, the solenoid may be connected to the body of the starter. On much older vehicles, the solenoid could be in a separate location that should to be checked prior to working on the starter. If the solenoid is integrated with the starter, it may be affected by oil soak or overheating, which could cause the starter to work intermittently or stop working altogether. Replacing a starter is a relatively straightforward task, so long as you are careful and take your time. As always, it is important to pay attention to safety as you will be interacting with the electrical system on your car. Step 1 – The first thing to do is determine where your starter is located on the engine. Some vehicles will have the starter under the engine. Some vehicles like a front-wheel drive car or SUV may have it on the top of the engine in which case it can be removed from above. Determine the location and how easily it will be to remove and replace. Also assess whether anything else will need to be removed to complete the work. Step 2 – Next you will want to ensure you have enough clearance to work on the vehicle. If working under the vehicle, you may want to use a floor jack to lift the vehicle onto jack stands or drive it onto ramps to support the vehicle off the ground. Step 3 – Once the vehicle is supported and you have ample working space, disconnect the negative battery cable from the battery, taking care to avoid electrical shock. Next disconnect the leads at the starter motor. One lead will be the battery power which will typically be the largest wire connected to the starter. There will be a signal wire with a connector, and older vehicles may have third wire connected to the ignition coil. Consider marking each with a piece of tape and labeling them to prevent a mix up during reassembly. Step 4 – The starter should be free to be removed, and now you can use your socket and ratchet set or a ratcheting wrench to remove the bolts securing the starter to the engine. Remove any heat shields, braces, or covers that may be connected to the starter prior to removing the starter itself. The starter is pretty heavy, so be ready to support it as you remove the last of the fasteners. Reassembly will be the reverse of the removal procedure. While the starter is out, you can also check the teeth on the starter ring gear. You can use a deep socket and breaker bar on the crankshaft pulley to turn the crankshaft and check each tooth as your spin the engine. Be sure to mark one of the teeth as your starting point so you know when to stop inspecting once it comes full circle. Also be sure to properly torque the bolts using a torque wrench upon final reassembly. Your new starter motor may not be an exact replica of the original you just removed (although the bolt holes should still align and the parts should still mate together perfectly), so don’t be worried if they don’t look identical. Manufacturers are continually transitioning to smaller and lighter starter designs with gear-reduction and high-speed motors to spin the engine faster using less current from the battery. This also tends to reduce part cost over time. AC Delco is one of General Motors’ largest suppliers for original equipment and replacement parts. They offer over 30 different product lines and provide high quality parts for all major vehicle systems. They will have a replacement starter for most vehicles available through your local and online retail locations. As AC Delco has been in the automotive electronics business for many years, it comes as no surprise that their starters are high quality and generally well regarded. Overall they are a convenient choice that is fairly priced. 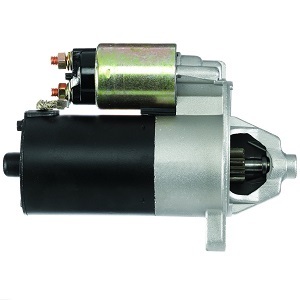 Click here to find an AC Delco starter for your vehicle. Denso was started over 60 years ago and has been a leader in technology advancement in the automotive sector. They manufacture and supply OEM quality replacement parts to most manufacturers around the globe. Like AC Delco above, Denso is big into automotive electronics components. They make quite a few ignition components such as coils and spark plugs, but their starters are also highly functional, durable, and affordable. They offer starters for most modern vehicles and are easy to find at most online parts suppliers. Bosch is another OEM supplier that offers everything from single replacement parts to complete vehicle systems. They offer high quality and consistent availability. Bosch is constantly developing new technologies and their products are used in everything from German sports cars to tracked military vehicles. Their quality is world renowned and their parts can be had cost effectively. Their starters are great. This has been a personal favorite of ours as we have used them on a number of our project BMWs with great results. The overall value proposition for Bosch’s starters makes them an easy choice if you need a replacement starter.